Downspouts are often out of sight, out of mind, until water begins to pool around the foundation of a home or business. When this happens, excess water can cause soil erosion and even seep inside the building, leading to water damage. The downspout and gutters may seem separate from the rest of a plumbing system, but they’re integral for proper plumbing functions. Avoid downspout and gutter hassles with plumbing services from Sunshine Plumbing and Gas. We offer a range of outdoor plumbing services, including downspout maintenance and repairs. Our team has the skills and experience necessary to remove debris and repair or replace sections to make sure that rainfall is diverted away from the foundation. Contact our plumbing repair company. The downspout is an essential part of any gutter system in outdoor plumbing. Gutters collect rainfall, directing the rushing water along the edge of the roof which prevents the water from splashing to the ground and pooling near the structure’s foundation. The water then flows through the downspout and away from the building. The pitch, or slope, of the downspout and gutter determines how well water will carry from the building. Downspouts are mostly made from vinyl or metals, such as aluminum, galvanized steel, and copper. Generally, downspouts are located at the corner of a building, but more than one may be used depending on the length of the building. Most have a splash block at the base to prevent soil erosion in the area underneath the downspout. How Can I Prevent Downspout Issues? There are a number of ways you can help prevent common plumbing issues that occur with the downspout and gutter, including the following. One of the best ways to avoid downspout and gutter issues is with professional plumbing services from Sunshine Plumbing and Gas. We will inspect the downspout and gutters, clean out any build up, repair any faulty components and replace any system components as needed. 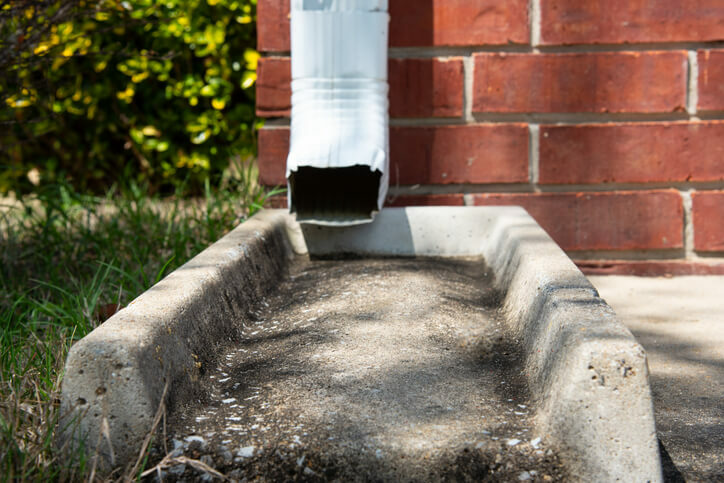 If you find a section of the gutter or downspout has been damaged, repair or replace it as soon as possible. The longer that a repair or replacement is put off, the more likely water will cause issues that are otherwise avoidable. How often the gutters and downspout need cleaning depends on where you live and how many trees there are around your residence. Most trees shed leaves in the fall, while oak trees shed pollen pods in the springtime that can also clog gutters and downspouts. Gutter covers, also called leaf guards, substantially reduce the number of leaves and other debris in gutters and downspouts. Why Do Downspouts Need To Be Clear Of Debris? Downspouts and gutters act as additional layers of protection against water damage. When debris collects in the downspout, water isn’t able to flow as it should. An accumulation of debris can also cause the following issues. The small openings in downspouts are an ideal size for bird or rodent homes, especially when there are sticks, grass, and other debris in the space. When pests nest in your downspout, your home or business is susceptible to both interior and exterior damage. Many homes and businesses have landscaping around the foundation and areas near the gutter system. When water spills over the gutter, soil erosion in the landscaping takes place. Depending on how much landscaping there is, there may be a considerable cost to replace damaged plants and trees. Backed up water in gutters and downspouts can quickly damage the fascia and roof edges. This leads to water damage in the building itself. When the fascia rots, the gutters pull away from the building, allowing water to run off the roof to the area around the foundation. In addition, the roofing and underlying material, usually wood sheeting, will become damaged from continued contact with water. Without immediate repairs, a leaky roof will likely cause serious damage to interior structures.